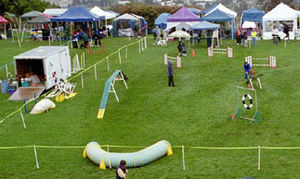 Dog agility is a sport in which a handler directs a dog through an obstacle course in an accurate race against the clock. Dogs must run off-lead with no food or toys as incentives. Consequently, the handler's only controls are voice and body language, requiring exceptional obedience training of the animal. In competition, the handler must assess the course, decide on handling strategies and direct the dog through the course, with precision and speed equally important. 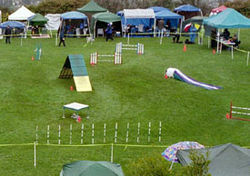 Dog agility is a fairly new sport, created as merely a demonstration in the late 1970s in the United Kingdom. It has since spread rapidly around the world, with major competitions held worldwide. At the 1978 Crufts, the demonstration immediately intrigued dog owners because of its speed and challenge and the dexterity displayed by the dogs. People wanted to see more, and indeed wanted their own dogs to be able to participate. The demonstration was so popular that it grew into local, then national, and eventually international, competitions with standardized equipment. 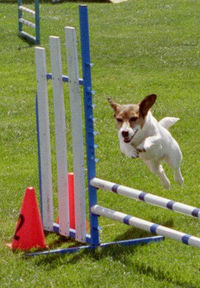 In 1980, The Kennel Club became the first organization to recognize agility as an official sport with a sanctioned set of rules. By this time, agility equipment included some additional elements modified from the training of police dogs and Schutzhund competitions, such as the A-frame and the dogwalk. Because each course is different, handlers are allowed a short walk-through before the competition starts. During this time, all handlers competing in a particular class can walk or run around the course without their dogs, determining how they can best position themselves and guide their dogs to get the most accurate and rapid path around the numbered obstacles. Each dog and handler team gets one opportunity together to attempt to complete the course successfully. 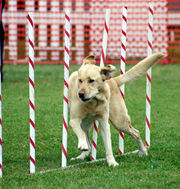 The dog begins behind a starting line and, when instructed by his handler, proceeds around the course. The handler typically runs near the dog, directing the dog with spoken commands and with the position of arms, shoulders, and feet. When all competitors have run, scoring is based on how many faults are incurred. Penalties can include not only course faults, such as knocking down a bar in a jump, but also time faults, which are the number of seconds over the calculated standard course time (SCT), which in turn is determined based on the competition level, the complexity of the course, and other factors. Two platforms, usually about 3 feet (1 m) wide by 8 to 9 feet (3 m) long, hinged together and raised so that the hinged connection is between five and six-and-a-quarter feet above the ground (depending on the organization), forming roughly an A shape. 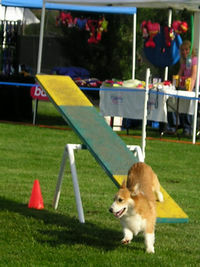 The bottom 36 to 42 inches (1 m) of both sides of the A-frame are painted a bright color, usually yellow, forming the contact zone, onto which the dog must place at least one paw while ascending and descending. Most sanctioning organizations require that A-frames have low profile, narrow, horizontal slats all along their length to assist the dog's grip going up and down. Three 8 to 12 ft (3 to 4 m) planks, 9 to 12 inches (25 to 30 cm) wide, connected at the ends. The center plank is raised to about 4 feet (1.2 m) above the ground, so that the two end planks form ramps leading up to and down from the center plank. This obstacle also has contact zones. Most sanctioning organizations also require slats on the dogwalk ramps; a slatless dogwalk looks almost the same as a teeter-totter to a dog approaching it head-on. A 10 to 12 foot (3 to 4 m) plank pivoting on a support, much like a child's seesaw. It is constructed slightly off-balance so that the same end always returns to the ground. This is done either by placing the support slightly off-centre or else weighting one end of the board. This obstacle also has contact zones. The balance point and the weight of the plank must be such that even a tiny dog, such as a Papillon or Chihuahua, can cause the high end of the seesaw to descend to the ground within a reasonable amount of time, specified by the sanctioning organization's rules (usually about 2 seconds). Smaller dogs get more time to run a course, and this is one reason why it can take them longer than it takes larger dogs. A vinyl tube, 10 to 20 feet (3 to 6 m) long and about 2 feet (60 cm) in diameter, through which the dog runs. The tunnel is constructed of flexible vinyl and wire so that it can be configured in a straight line or curved. A barrel-like cylinder with a tube of fabric attached around one end. The fabric extends about 8 to 12 feet (3 to 4 m) and lies closed until the dog runs into the open end of the chute and pushes his way out through the fabric tube. Two upright bars supporting a horizontal bar over which the dog jumps. The height is adjusted for dogs of different heights. The uprights can be simple bars or can have wings of various shapes, sizes, and colors. Two or three sets of uprights, each with horizontal poles. The Double can have parallel or ascending horizontal bars; the triple always has ascending bars. The spread between the horizontal bars is sometimes adjusted based on the height of the dog. A set of four or five slightly raised platforms that form a broad area over which the dog must jump without setting their feet on any of the platforms. Length is adjusted for dog's height. This is just what it sounds like: A tire shape suspended in a frame. The dog must jump through the opening of the tire, which varies between about 18 and 24 inches (450 to 600 mm). The tire is usually wrapped with tape so that there are no openings or uneven places in which the dog could catch. The height is adjusted for dogs of different sizes. Similar to a slalom, this is a series of upright poles, each about 3 feet (1 m) tall and spaced about 20 inches (50 cm) apart, through which the dog weaves. It is one of the most difficult obstacles for a dog to master. It varies from 5 to 12 poles at one time. The dog must always enter with the first pole to his left and must not skip poles. An elevated square platform about 3-foot-by-3-foot (1-meter-by-1-meter) square onto which the dog must jump and pause, either sitting or in a down position, for a designated period of time which is counted out by the judge, usually about 5 seconds. The height ranges from about 8 to 30 inches (20 to 75 cm) depending on the dog's height and sponsoring organisation. The teeter-totter (or seesaw) and the weave poles are the most challenging obstacles to teach, the first because many dogs are wary of the board's movement, and the second because it is not a behavior that they would do naturally over a series of 12 poles. However, it can also be challenging to train the dog to perform its contact obstacles in a manner that ensures that they get paws into the contact zone without sacrificing speed. This article is licensed under the GNU Free Documentation License. It uses material from the Wikipedia article "Dog Agility".